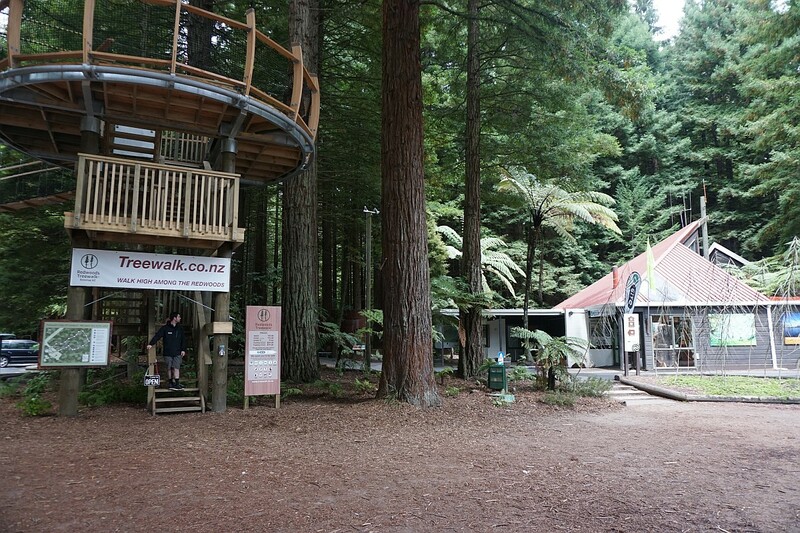 Tickets for access to the walkway can be purchased at the information centre next to the starting point, and there are parking facilities and toilets nearby. 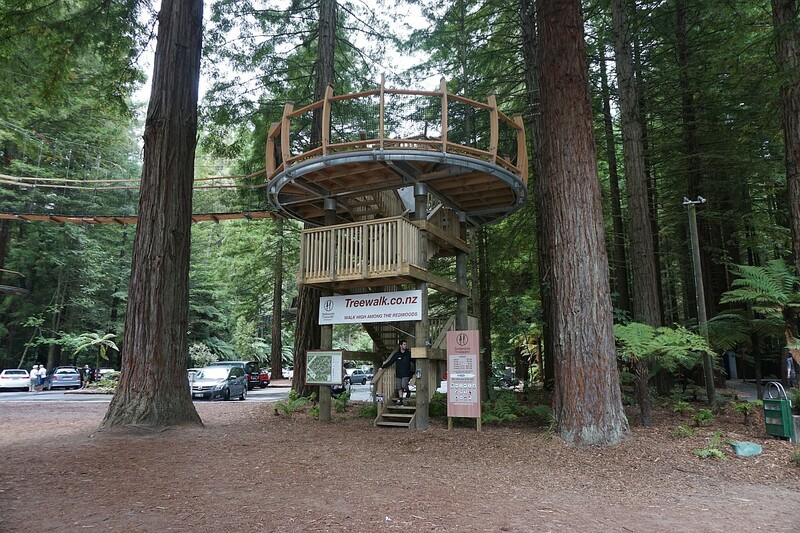 The steps leading to the first platform have been constructed between redwood (Sequoia sempervirens) trees, with the platform supported by 4 poles instead of being suspended in a tree. 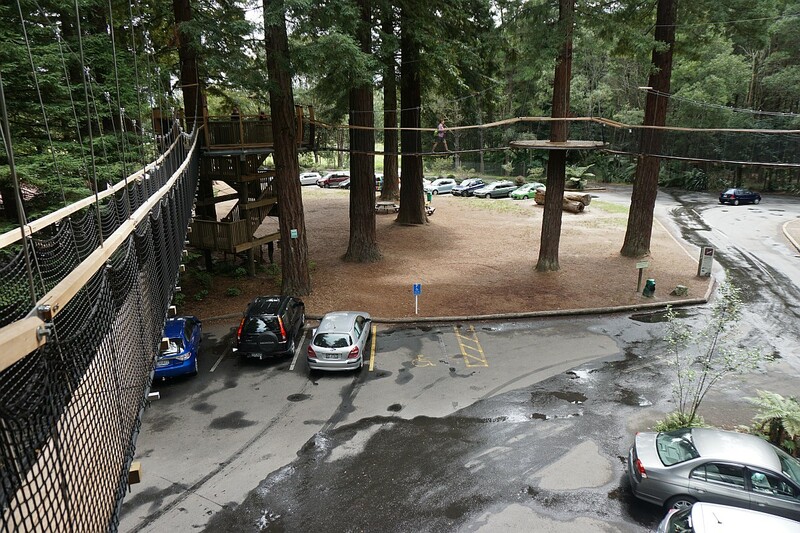 All the other platforms are suspended in trees, without being permanently fixed to the trees. The information centre, to the right, is close to the walkway access steps and platform. 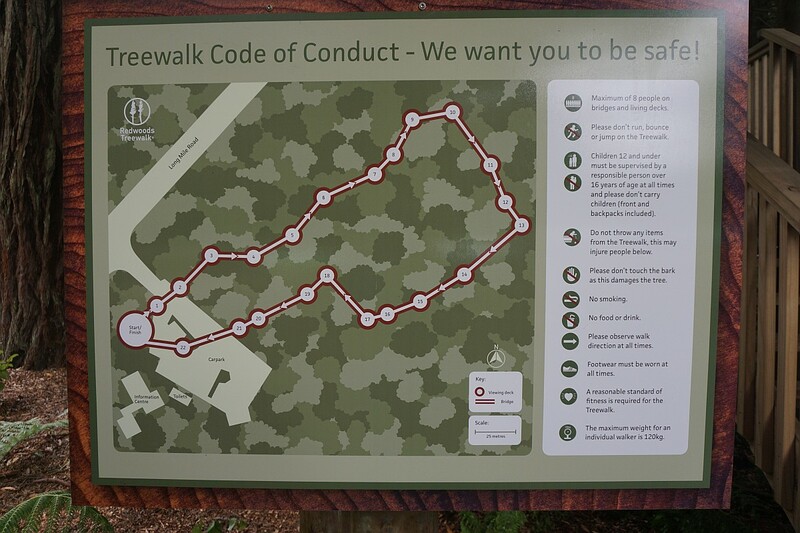 The panel at the access steps shows the layout of the walkway, and the Code of Conduct for using the walkway. 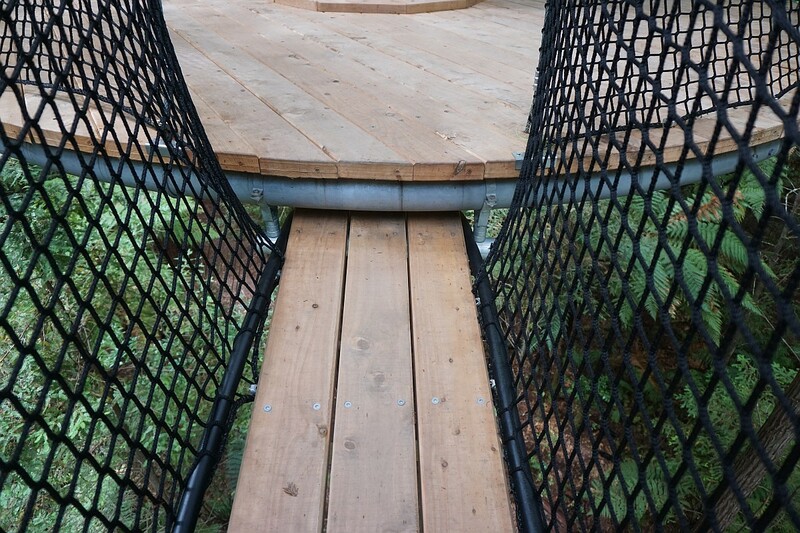 On this panel there are 23 suspension bridges shown, but the official web site claims there are 21 bridges. The walkway must be traversed in a clockwise direction. Looking from the start/end platform to the first suspended platform. 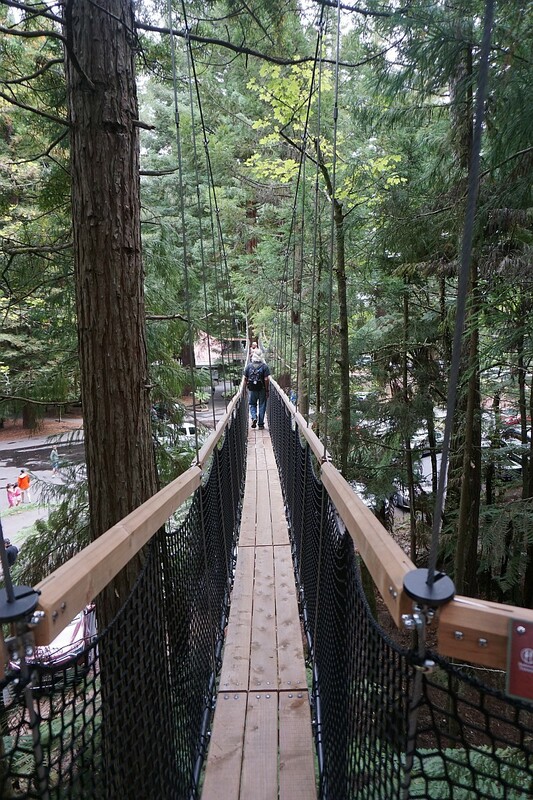 The bridges differ in width, but all of them have a limit of 8 persons at a time. 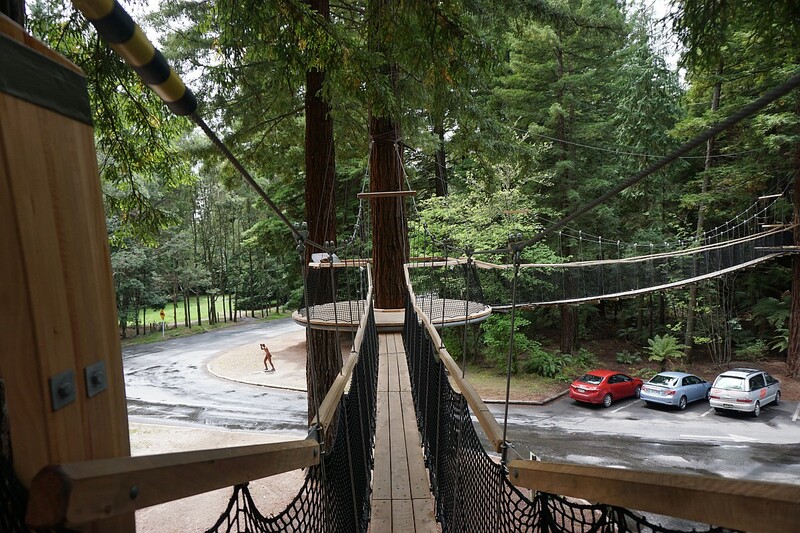 The platforms and the bridges have separate attachment points on the trees. 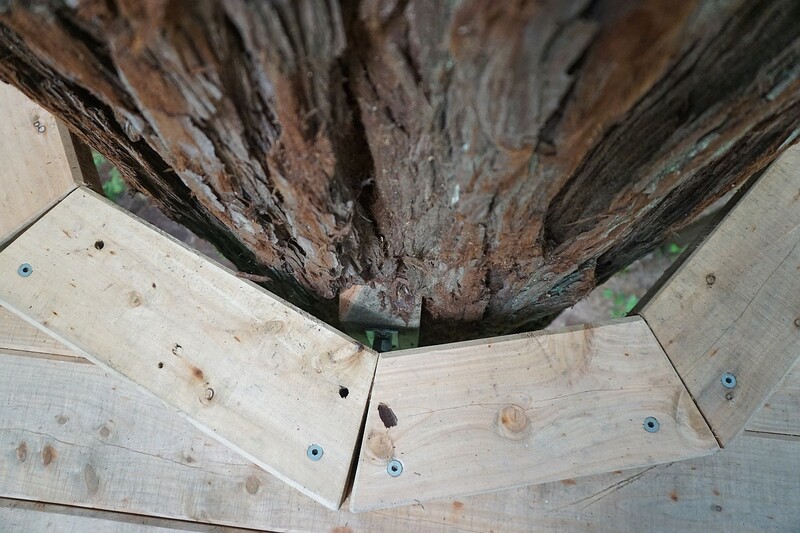 Only friction holds the suspension belts in place, and they can be manually adjusted as the trees grow, although this would be a major undertaking since all pressure has to be removed from the bindings. The lower ones support the bridges, the upper ones the platform. The bridges can move relative to the platform. The two are not joined, so bridge movement only minimally affects platform movement. The steel platform perimeter ring supporting the wooden deck on the platforms can also be seen. 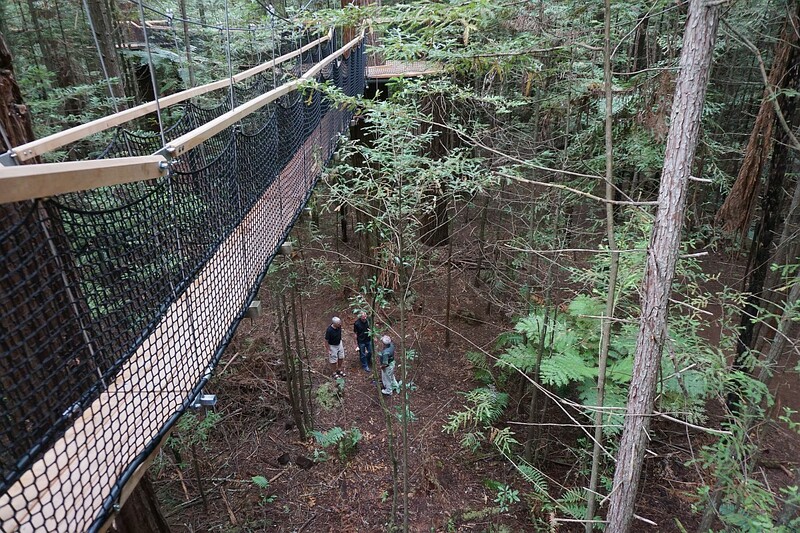 The trees are of varying sizes, with the largest being about 2 metres in diameter at 1.4 metres above ground level. 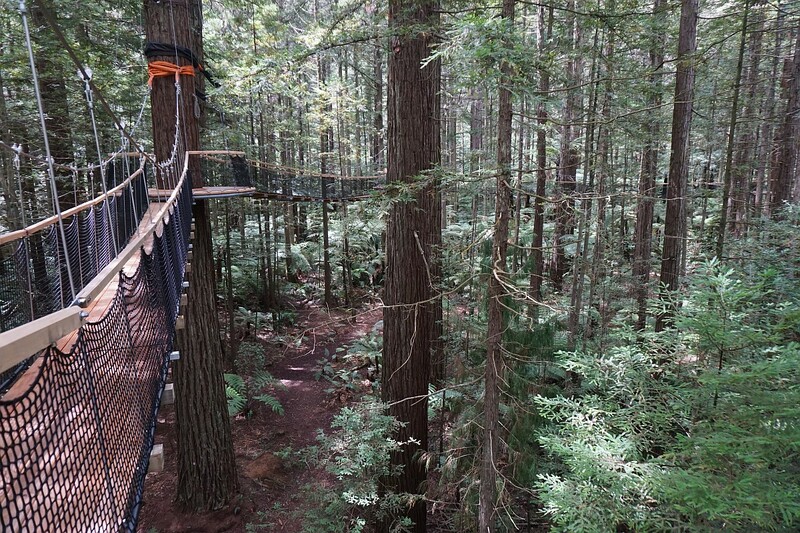 The inner ring of the platforms is quite close to the bark on the trees, without touching the trees. 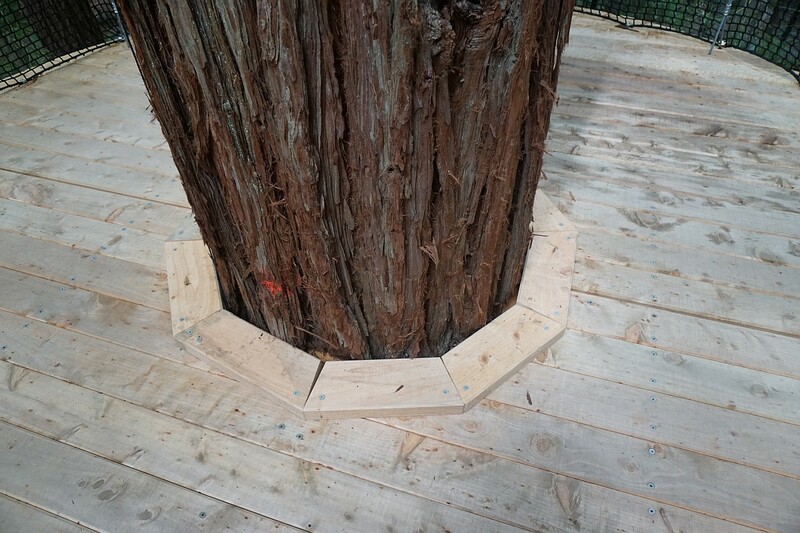 There are wooden adjustable spacers that stop the platforms from moving sideways and damaging the bark or the tree. At first glance it looks as if they are bolted to the trees. Several of the platforms have information panels attached. 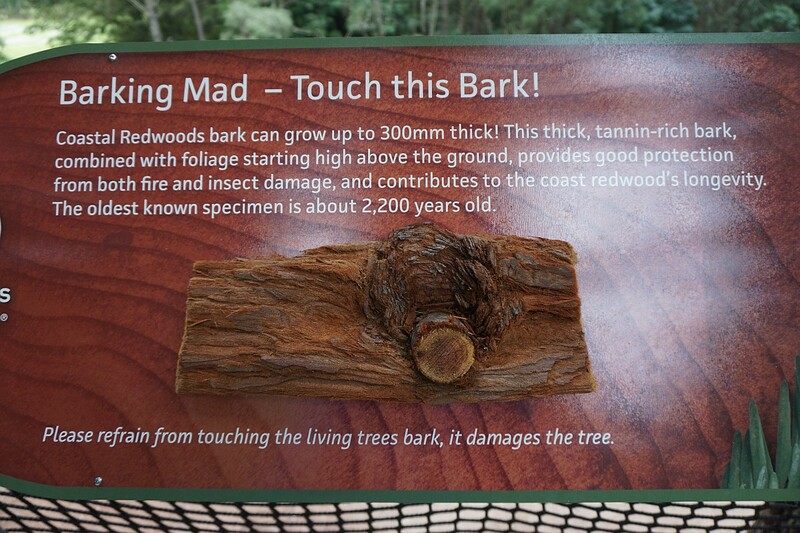 The bark on the trees themselves should not be touched, so one of the panels has a sample of the soft bark that can be touched. 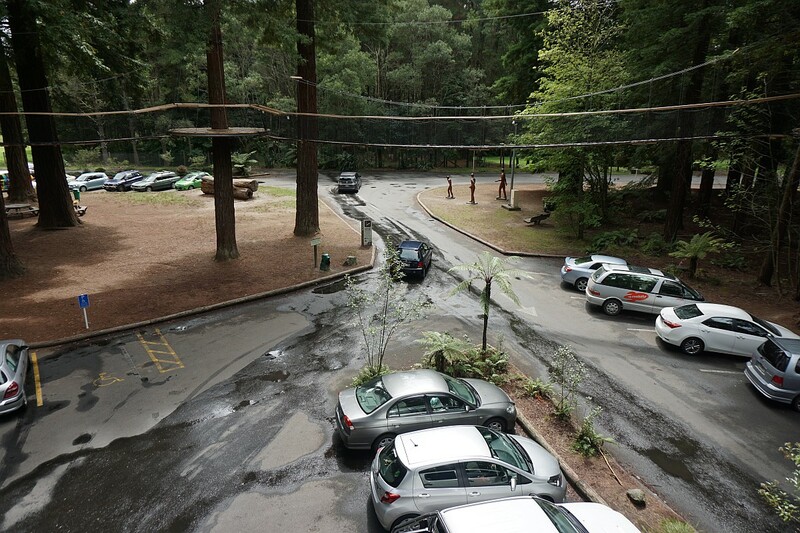 Looking down on the parking area and access road from suspended platform number 2. 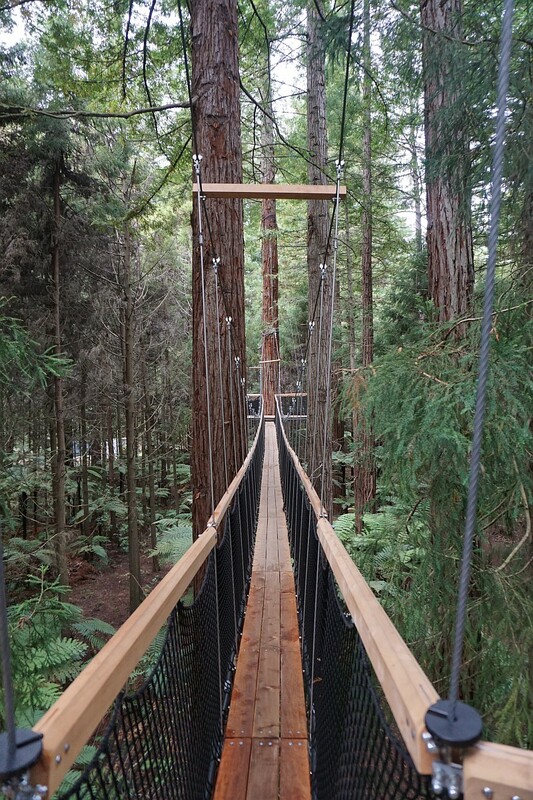 One of the longest suspension bridges. 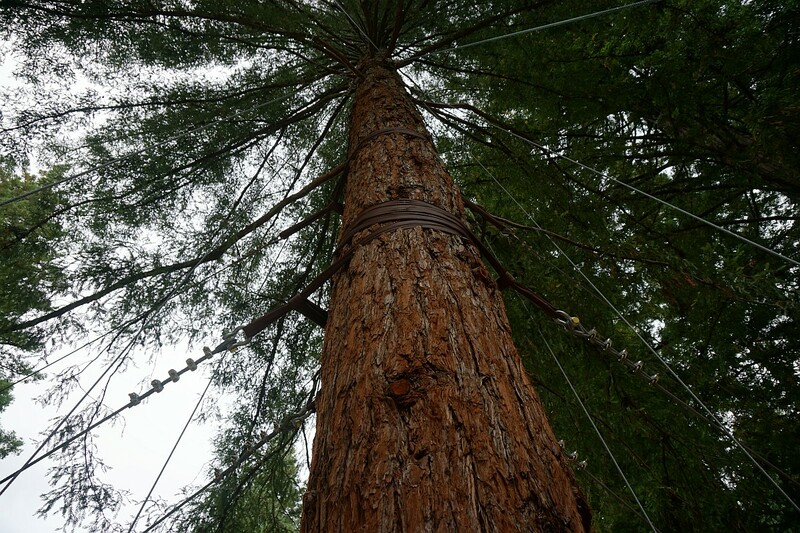 New redwood trees are growing up among the larger ones, which were planted in 1901. Various ferns also provide a large part of the undergrowth. Heading back to the ending platform across the carpark and access road. 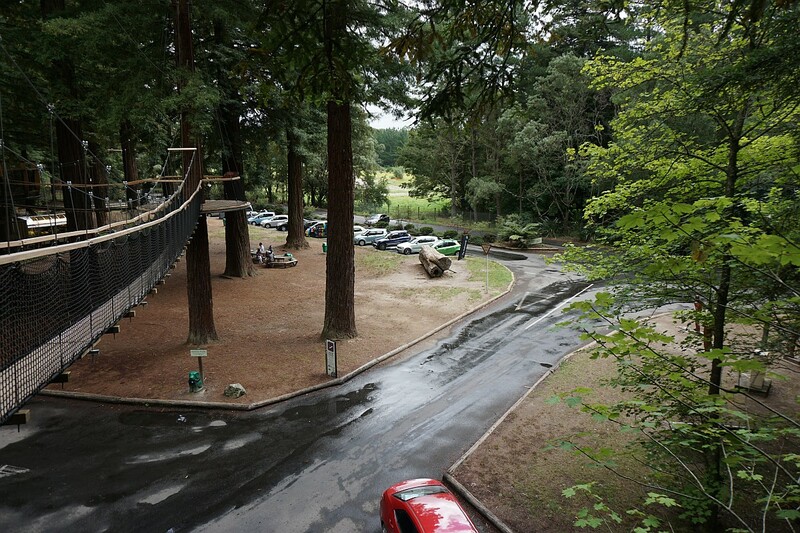 The first two bridges of the walkway can be seen suspended above the carpark and access road. The walk can be done at any pace, but must be done in a clockwise direction. 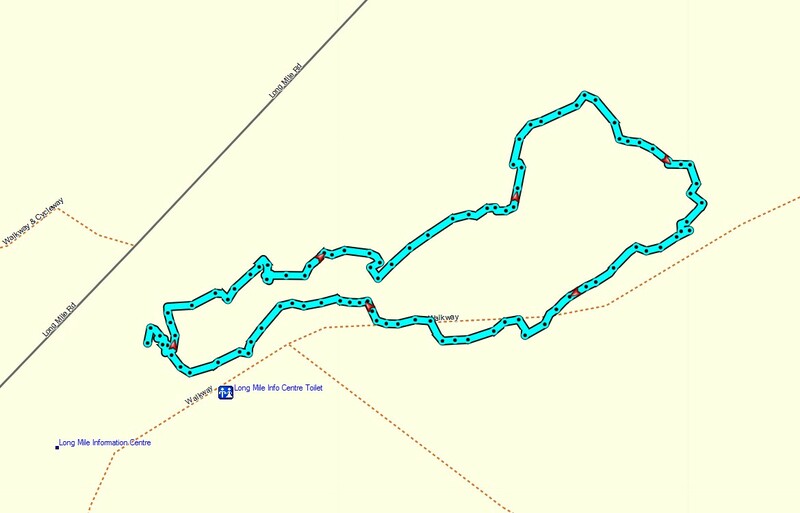 The GPS log shows the walkway in a similar shape to that shown in the information panel, although the tree cover reduces the accuracy of the GPS considerably. Total time for the walk, including plenty of time for taking photos, was just under 30 minutes. The starting and ending point is on the far left end of the tracklog. The walk was done on February 16, 2016.